Chelsea brought this article and this fantastic little apartment to my attention. I am guilty of not covering apartments very often but I love the use of space in this one and you must see it. 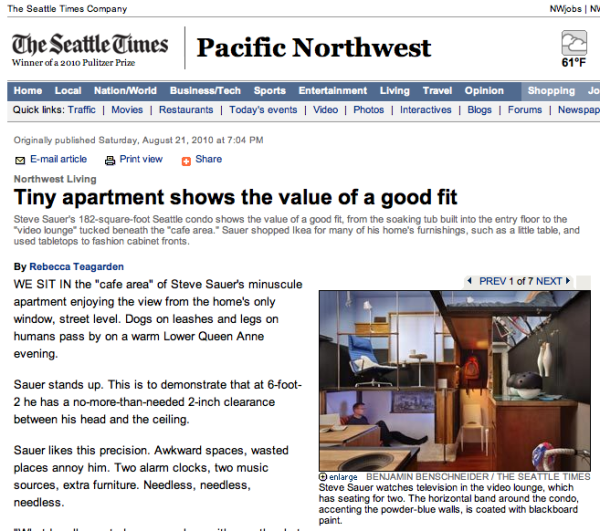 The article written by The Seattle Times Rebecca Teagarden is titled “Tiny apartment shows the value of a good fit” and talks about Steve Sauer’s 182-square-foot Seattle condo which shows the value of a good fit, from the soaking tub built into the entry floor to the “video lounge” tucked beneath the “cafe area.” Sauer shopped Ikea for many of his home’s furnishings, such as a little table, and used tabletops to fashion cabinet fronts. Saurer’s says, “What I really wanted was one place with exactly what I needed and wanted. Quality is more important than quantity for me, and extra space only a problem,” he has written, describing his nearby too-big-for-him, one-bedroom condo. When Sauer couldn’t find the things he needed, he designed them and built them: The stainless-steel shower caddy, towel bar. For other pieces, “Ikea came through again.” Lighting, cabinet pulls, and butcher block for shelves, the table top and cabinet fronts. The rich flooring, Brazilian walnut, was installed by Matt Messenger. A bureau from West Elm fit to 1/8 of an inch, and so it was ordered. Top 5 Sources for Tiny Trailer Houses for Sale NOW! This is definitely one of the cooler designs I’ve seen on this blog… love the way he was able to use all the space and still keep some separation between his living/dining/sleeping areas. Very interesting and cool use of space, though the concept of “shopping daily” would be a deal killer for me (though I realize that’s the designers’ / owners’ choice, and everyone should be able to live the way they chose). In addition to being into tiny homes/spaces, I also have “survivalist leanings”, and I’d never want to live literally day-to-day. But again, that’s just me. I would love to know about the blue chair in the cafe area – looks comfy! Cool space! The blue chair is an Eames Aluminum Group Lounge Chair. What is under the tub? I like the idea, but doesn’t it stick into someone else’s living space? The article said the window was at ground level so maybe the tub sticks down into the basement. I wondered the same thing and that’s the best I can figure. I think he raised the floor over the tub… It looks like there are a few steps down into the bathroom? If you’re interested in small apartment living a book to keep an eye out for is Tokyo: a certain style. It’s a pocketbook size collection of photos taken by Kyoichi Tzusuki in the 1990s of various “real world” Tokyo living spaces, some of them incredibly small. I would assume it’s probably out of print by now but some folks might find it worth the effort to find. I just LOVE this. All these little purpose specific areas, so cute but fit together so uniquely. This is what I love about tiny spaces, not an inch is wasted. Kudos! I like well designed small spaces and really appreciate the ingenuity of this one but imagining myself living in it….gimme air! Hi Deek! All my parties are in the pico-dwelling, and the biggest one topped out with 17 people merrily partying away (though about 14 max is a good guideline). I’d like to see a floor plan. My sweetiepie is an engineer. I showed him this last night and he loved it. Though… VERY expensive to do all that custom work. Reminds me of an awesome video I recently saw about a Japanese apartment that can turn into 24 separate rooms. How does the dweller fill the bathtub? I want to know because I am ready to install one under my floorboards! How does he get into the cafe area? I did not see a ladder or steps. his condo is almost as nice as the sleeper compartment in my 18 wheeler! only disadvantage to the small area is that trash piles up really fast. I can’t get over that article, I read it and loved it!